Smoking Gravy Powder, sounds like something a college student would attempt after a heavy night out. I remember when I was at college my friend George tried drying Banana skins under the grill in an effort to create a legal high, setting fire to the cooker , and resulting with a very difficult conversation with a Fireman and the Provost at 3 am who had come in answer to the smoke alarm, but even he, trendsetter that he was didn’t go as far as smoking Gravy Powder. here I suspect I am treading a new path. Let me start again and you can see where I am going with this. Several members of my family have food allergies, which means there are very few off the shelf products we can buy. When this first raised its head 20 years ago, a number of things disappeared from my plate, but the one I missed the most was gravy. Due to the additives in commercial gravy powder we cant have it, and so that set me off on that great food journey to where we are today. Over the years I have developed various sauces and ingredients which I can make to replace the commercial products denied me. Several of these are so good you feel disappointed when I do get to have the commercial version again. Bread is a classic example. We make it fresh every day. However sometimes when I am working away I try a supermarket sandwich, and it doesn’t come close. Anyway we digress. after a few years we did manage to find a commercial gravy liquid we could have, but now the manufacturers have changed the recipe, which now includes ingredients we cant have. So the hunt is now on for a Tom Green Substitute. From which then came the surprise of the summer Smoked Tomato powder which we now couldn’t live without, it finds it way into all manner of meals. Since then I have tried smoking and dehydrating several vegetables. Smoked Pepper powder was a critical success, Home grown and smoked paprika whilst great it turned out too hot for my palette, as it turned out I grew what for me would be a very hot pepper ( 5000+ scoville), so this year I am growing a milder paprika pepper. However we haven’t tried a smoked vegetable mix. 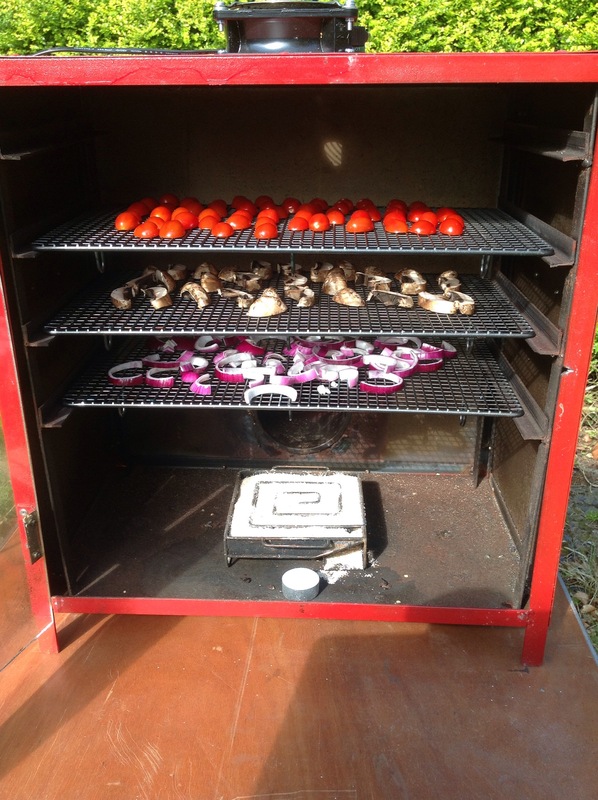 So today we have dried tomato, mushroom, and red onion, smoked with maple wood, and then powdered. The resultant powder is then mixed with some corn flour act as a thickener, and hey presto you have additive free, allergy friendly , meat free, salt free gravy powder with extra flavour. As always this is just one more step along the way, we can improve on this first attempt. Its pretty good, but as all my old school reports frequently said – he can do better he just needs to try. I am back on stage at the Forty Hall food festival this summer so I might just have found what I am doing. This entry was posted in bake, baking, barbecue, bbq, Cooking, craft, Diy, family, food, heritage craft, heritagecraft, kitchen, old bloke, old blokes kitchen, smoker, tom green, Uncategorized, youtube and tagged experiment, family, food, gravy, home, humour, middle age, smokin, smoking, video. Bookmark the permalink.